The process of manipulating genes, usually outside the organism’s normal reproductive process is called genetic engineering or genetic modification (GM) or gene splicing. Make a crop resistant to herbicide. Producing a new protein or enzyme. The best example of genetic engineering is production of human insulin through the use of modified bacteria. Production of erythropoietin in Chinese Hamster ovary cells. The production of new types of experimental mice such as the OncoMouse (cancer mouse) for research, through genetic redesign. In Genetic engineering a protein is specified by a segment of DNA called a gene. This protein can be modified by changing the gene’s DNA. One to this is to isolate the piece of DNA containing the gene, precisely cut the gene out. Then reintroduce (splice) the gene into a different DNA segment. Daniel Nathans and Hamilton Smith received the 1978 Nobel Prize in physiology or medicine for their isolation­ restriction endonucleases. These enzymes are able to cut DNA at specific sites. They also discovered ligase, which can join fragments of DNA together. The restriction enzymes formed the initial basis of recombinant DNA technology. Isolation of a specific deoxyribonucleic acid (DNA) molecule or molecules to be replicated (the passenger DNA). The joining of this DNA with a DNA vector (also known as a vehicle or a replicon). It is capable of autonomous replication in a living cell after foreign DNA has been inserted into it. The transfer, via transformation or transfection, of the recombinant molecule into a suitable host. (a) DNA restriction: The most common method of isolation of Passenger DNA is DNA restriction. Restriction endonucleases break the high-molecular weight DNA into fragments. Three different classes of these enzymes are present. But only type II restriction endonucleases are used extensively in the manipulation of DNA. Type II restriction endonucleases are DNAases. They recognize specific short nucleotide sequences (usually 4 to 6 base pairs in length), and then cleave both strands of the DNA duplex. It generates discrete DNA fragments of defined length and sequence. The various fragments of a specific DNA are separated into different bands of distinct molecular weights by agarose gel electrophoresis. Specific sequences of these bands can be identified by a technique called Southern blotting. In this technique, DNA restriction fragments present on a gel are denatured. They are blotted on a nitrocellulose filter. The filter is incubated together with a radioactively labeled DNA or RNA probe. These probes are specific for the gene under study. The labeled probe hybridizes to its complement in the restricted DNA. The regions of hybridization are detected by autoradiography. Fragments of interest can then be separated out of these gels and used for cloning. (b) Sonification: It is another method used to generate small DNA fragments by mechanical shearing. In this case, intense sonification of high-molecular-weight DNA is done with the help of ultrasound or high-speed stirring blender. This method is used to produce DNA fragments of a certain size range. Shearing results in random breakage of DNA. It produces termini consisting of short, single-stranded regions. (c) Complementary DNA: Other source of DNA is synthesis of complementary DNA (cDNA). It is synthesized in test tube artificially by joining nucleotides. (a) The cleavage with a restriction endonuclease creates cohesive ends (sticky ends). These fragments can be jointed with a similarly cleaved DNA from another source like vector. The joint has nicks a few base pairs apart in opposite strands. The enzyme DNA ligase is used to repair these nicks. It forms an intact duplex recombinant molecule. Cohesive ends can also be created by the addition of synthetic DNA linkers to blunt-ended DNA molecules. (b) Another method for joining DNA molecules involves the addition of homopolymer extensions to different DNA fragments. These homopolymer extensions then join the DNA fragments. For example: short nucleotide sequences of pure adenine are added to the 3 ends of one population of DNA molecules. Short thy thymine blocks are added to the 3 ends of another population. The two types of mecules can then join to form mixed dimeric circles that can be used directly for transformation. The enzyme T4 DNA ligase carries out the intermolecular joining of DNA substrates at completely base-paired ends. The desired DNA sequence attached to a DNA vector is transferred to a suitable host. Transformation is defined as the introduction of foreign DNA into a recipient cell. Transformation of a cell with DNA from a virus is called transfection. Transformation in any organism involves (1) a method that allows the introduction of DNA into the cell and (2) the stable integration of DNA into a chromosome, or maintenance of the DNA as a self-replicating entity. Escherichia coli is the host of choice for cloning experiments. The transformation of E. coli is an essential step in these experiments. E. coli are treated with calcium chloride. They then take up DNA from bacteriophage lambda and another plasmid DNA. Calcium chloride causes some structural alteration in the bacterial cell wall. Bacillus Species: transformation in Bacillus species is done by polyethylene glycol-induced DNA uptake in the bacterial protoplasts. The bacterial cell wall is later regenerated. Actinomycetes can be similarly transformed. Transformation can also be achieved by first entrapping the DNA with liposomes. Later these liposomes are fused with host cell membrane. Similarly, transformation methods have been developed for lower eukaryotes such as yeast Saccharomyces cerevisiae and the filamentous fungus Neurospora crassa. Several methods are available for the transfer of DNA into cells of higher eukaryotes. Specific genes or entire viral genomes can be introduced into cultured mammalian cells in the form of a coprecipitate with calcium phosphate. DNA complexed with calcium phosphate is readily taken up and expressed by mammalian cells. DNA complexed with diethylamino-0ethyl-dextran (DEAE-dextran) or DNA trapped in liposomes or erythrocyte ghosts may also be used in mammalian transformation. Bacterial protoplasts containing plasmids can be fused to intact animal cells with the help of chemical agents like polyethylene glycol (PEG). DNA can be directly introduced into cells by micro-injection. The efficiency of transfer by each of these methods is quite variable. In plants, the (T)-DNA region of the tumor-inducing (Ti) plasmid of Agrobacterium tumefaciens are used to introduce DNA into plant cells. But there are limitations of the host range of A. tumefaciens. Therefore, alternative transformation systems are developed for gene transfer in plants they include the use of liposomes and induction of DNA uptake in plant protoplasts. Foreign DNA is also introduced into plant cells by a technique called electroporation. This technique involves the use of electric pulses to make plant plasma membranes permeable to plasmid DNA molecules. Plasmid DNA takes up in this way has been shown to be stably inherited and expressed. Use of Particle Gun: This method is developed by John C. Sanford and Theodore M. Klein of Cornell University in 1987. They introduced DNA into a plant tissue culture callus. They developed a device called particle gun. This gun bombards a callus with microscopic metal particles. These particles are coated with DNA. The callus produces genetically altered somatic embryos. These embryos produce adult plants. 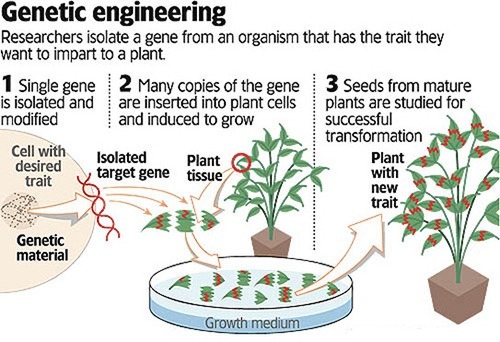 Many plants like corn and wheat varieties are genetically engineered by this method. There is a large variety of potential vectors for cloned genes. The vectors differ in different classes of organisms. Prokaryotes and Lower Eukaryotes: Three types of vectors are used in these organisms: plasmids, bacteriophages, cosmids. Plasmids: Plasmids are extrachromosomal DNA sequences that are stably inherited. Escherichia coli and its plasmids constitute the most versatile type of host-vector system known for DNA cloning. 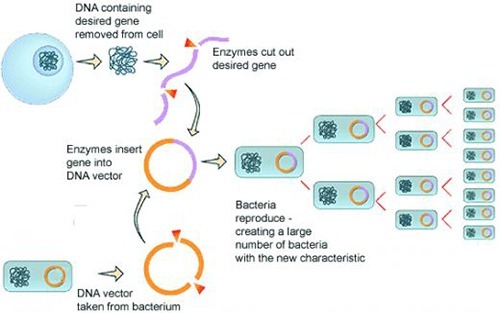 Several natural plasmids, such as ColEl, have been used as cloning vehicles in E coli. In addition, a variety of derivatives of natural plasmids have been constructed by combining DNA segments and desirable qualities of older cloning vehicles. The most versatile and widely used of these plasmids is pBR322. 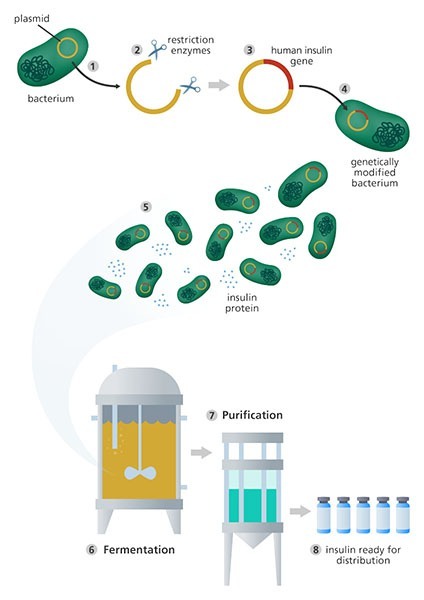 Transformation in yeast has been demonstrated using a number of plasmids, including vectors derived from the naturally occurring plasmid of yeast. Bacteriophage: Bacteriophage lambda is a virus of E coli. Several lambda-derived vectors have been developed for cloning in E, coli. These lambda derivatives have several advantages over plasmids: (1) Thousands of recombinant phage can easily be screened for a particular DNA sequence on a single petri dish by molecular hybridization. (2) Packaging of recombinant DNA in laboratory cultures provides a very efficient means of DNA uptake by the bacteria. (3) Thousands of independently packaged recombinant phages can be easily replicated and stored in a single solution as a “library” of genomic sequences. Cosmids: Plasmids have also been constructed that contain the phage cos DNA site and ColEl DNA segments. Cos DNA is required for packaging into the phage particles. ColEl DNA segments required for plasmid replication These plasmids are called as cosmids. The recombinant cosmid DNA is injected into a host. They circulate like phage DNA but replicates like plasmid. (b) Animal cells: Very few vectors are available for introducing foreign genes into animal cells. The most commonly used are derived from simian virus 40 (SV40). Normal SV40 cannot be used as a vector. However, SV40 mutants lacking portions of the genome can be used as vector. (c) Plant cells: Two systems for the delivery and integration of foreign genes into the plant genome are the Ti plasmid of the soil bacterium Agrobacterium and the DNA plant virion cauliflower mosaic virus. The Ti plasmid is a natural gene transfer vector carried by A. tumefaciens, a pathogenic bacterium. It causes crown gall tumor formation in dicotyledonous plants. A T-DNA segment present in the T i plasmid becomes stably integrated into the plant cell genome during infection.